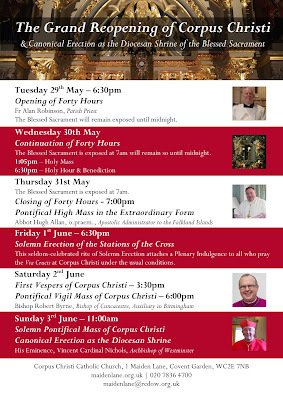 The church of Corpus Christi in the Covent Garden district of London is planning a week-long series of celebrations to mark its official ‘re-opening’, culminating in a Pontifical High Mass of Corpus Christi celebrated by Cardinal Vincent Nichols, Archbishop of Westminster, on Sunday, June 3rd, at 11 am, at which he will officially proclaim the church a Diocesan Shrine dedicated to the Blessed Sacrament. The Mass will be followed by a Procession of the Blessed Sacrament in Covent Garden. When the church was opened in 1874, Cardinal Henry Manning, the then Archbishop of Westminster, said Corpus Christi would be “specifically devoted to the adoration of the Blessed Sacrament.” As the first Catholic church in England to be named Corpus Christi since the Reformation, its construction was intended as reparation for the offences against the Blessed Sacrament committed in England since the 16th century. The church has lately undergone extensive renovation and restoration work over the course of five years at the request of Cardinal Nichols. 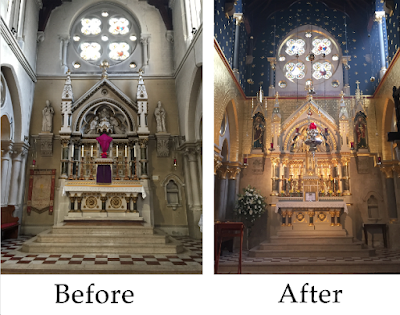 The building work has been complemented by the establishment of a Sodality of the Blessed Sacrament, a Confraternity with hundreds of members worldwide. The traditional 40 Hours Devotion will begin on the preceding Tuesday, May 29th at 6:30 pm, and will close with a Pontifical High Mass in the Extraordinary Form celebrated by Abbot Hugh Allan, O. Praem., on Thursday, May 31st, at 7:00pm. In addition, the new Stations of the Cross will be solemnly erected on Friday, June 1st, at 6:30 pm according to the traditional rites of the Church. The stations were sculpted by the artist Arthur Fleischmann and kindly donated in his memory by his widow, Joy, who will be present at this celebration. 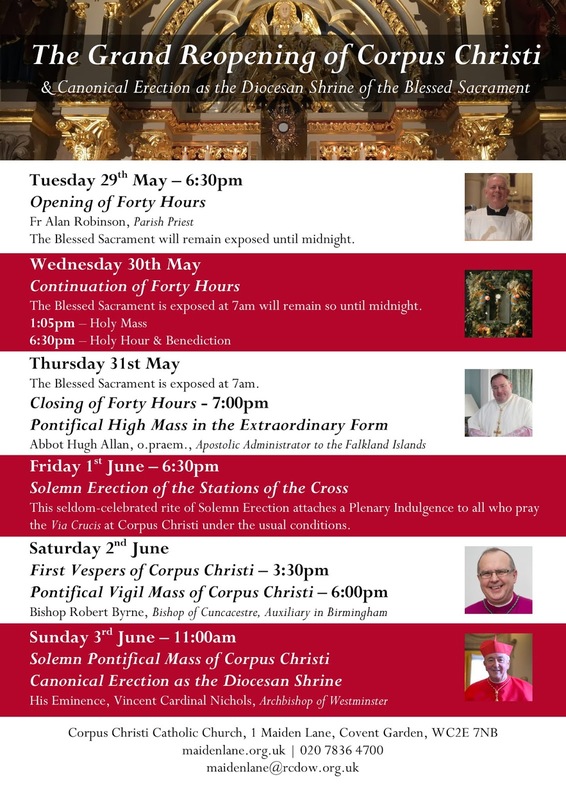 On Saturday 2nd June, there will be a Pontifical First Vespers of Corpus Christi, celebrated by Bishop Robert Byrne, Cong.Orat., Auxiliary in Birmingham, starting at 3:30 pm, followed by a Pontifical Vigil Mass at 6:00 pm.